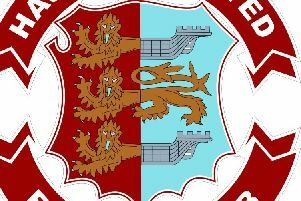 Bexhill United Football Club continued its splendid start to the season by winning away to previously unbeaten opposition. A pair of Craig Ottley penalties and a Gordon Cuddington goal gave the Pirates a 3-1 win away to Seaford Town in Macron Store Southern Combination Football League Division One yesterday (Monday). Seaford made the better start and it took Bexhill 10 minutes or so to get going, but once they did, the game became fairly even. Bexhill played more of the football, with Seaford going a bit more direct. A key moment came when Bexhill opened the scoring. The ball was played in to Drew Greenall just inside the box and a Seaford centre-half clattered into the back of him. Ottley converted the resulting penalty. Bexhill really clicked into gear after that and got on top only for Seaford to equalise with a freak goal. After Bexhill cleared a Seaford corner, Steve Stracey lobbed the ball back in, a player on either side missed their attempted headers and it bounced over goalkeeper Dan Rose into the top corner. The visitors retook the lead on the stroke of half time. Kyle Holden picked the ball up and beat one opponent before being fouled by a second as he burst into the box. Ottley again made no mistake from the spot. Bexhill were very composed in possession during the second half, with the midfield particularly strong. Nathan Lopez was everywhere, while Holden, having picked up an early booking, put in a very mature display and was similarly impressive despite struggling with a shoulder problem. For long spells Bexhill were pushing for a third goal rather than Seaford for an equaliser and they carved out a couple of decent chances. Greenall brought a fantastic save out of the Seaford goalkeeper, who tipped his goalbound shot onto the underside of the crossbar. Bexhill’s third goal arrived with around 10 minutes remaining. Corey Wheeler danced his way down the left, cut into the box and drilled the ball across goal for Cuddington to finish into the corner of the net. That goal relieved the pressure and gave Bexhill the cushion they wanted to see the game out comfortably on a warm morning at The Crouch. Bexhill: Rose; Rea, Robertson, McFarlane, Ottley (Gouet); Holden (Giles), Lopez, Cuddington; Kidman, Wheeler (Butchers), Greenall.